This article by Dr Anita Malhotra, Senior Lecturer in Ecology and Evolutionary Genetics, School of Biological Sciences, Bangor University was originally published on The Conversation. Read the original article. Credit Christopher AustinExactly why these skinks are filled with this toxic substance and why it doesn’t kill them is something of a mystery. But new research published in Science Advances makes an important step towards answering these questions. Whereas the red colour of most animals’ blood comes from the oxygen-carrying pigment in red blood cells called haemoglobin, the green colour in the New Guinea skink blood comes from a kind of bile pigment called biliverdin. It is formed as red blood cells break down and is held in the plasma, the liquid that makes up most of the blood. In large quantities, it masks the red colour of haemoglobin completely. Humans and other animals produce biliverdin too, but we excrete it into the intestine where it is eliminated from the body before it builds up to toxic levels. In humans, biliverdin causes jaundice at concentrations 40 times lower than found in the green-blooded skinks, who apparently suffer no ill-effects. We don’t know how the lizards are able to withstand so much biliverdin in their system. In some fish with green blood, biliverdin is tightly bound to a carrier protein which inactivates it and prevents its elimination from the body. Scientists have put forward several reasons why it might be beneficial to have so much biliverdin in the body, including making them taste bad to predators, or as an extreme form of camouflage. 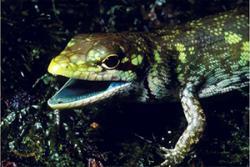 But most of these ideas are not convincing when applied to the New Guinea skinks. For example, feeding trials using native New Guinea birds and snakes have suggested that they are actually perfectly edible even with the biliverdin. A more plausible explanation is that it may help to control the proliferation of blood parasites such as malaria, which are prevalent and debilitating in lizards. More recent experimental work on other animals has suggested that bile pigments, including biliverdin, may act as antioxidants. These protect the body from damaging molecules known as free radicals and have an important anti-inflammatory effect. Another way to get an insight into why this feature evolved is to compare the green-blooded animals to close relatives with red blood. This is a challenge as skinks are among the most diverse families of lizards – and these particular skinks come from a relatively understudied set of animals in a remote part of the world. In fact, it wasn’t even known for certain whether all five species of green-blooded skinks, which had been placed in the same genus Prasinohaema (Greek for “green blood”), really were each other’s closest relatives. Their green blood seems to be the only characteristic that they share. If they are all closely related, then the evolution of green blood would have been a single unique event. This would make it difficult to choose among multiple possible causes and to know how applicable they were to other organisms with green blood. The new research from scientists at Louisiana State University shows definitively that these lizards are not a closely related group. To do this, they built a highly robust evolutionary tree of over 50 species of Australasian skinks using thousands of genetic markers shared by the lizards. This revealed that this unusual characteristic has evolved at least four times independently, and all the related species with normal blood that share a common ancestor with green-blooded species are also found only in New Guinea. To fully understand how the green-blooded lizards evolved this bizarre condition, we would need more in-depth studies of the specific gene mutations responsible. But now that we know that it has evolved repeatedly it gives scientists more power to disentangle the reasons why. What’s more, it suggests that there is indeed an underlying adaptive advantage for the retention of high levels of biliverdin, as it would be extremely unlikely for such an unusual condition to evolve multiple times by chance. This conclusion is exciting, partly because it reveals how little we still know of the astonishing diversity of life and its peculiarities. But in addition, given that biliverdin seems to play an important role in some important human problems involving inflammation, including septic shock and wound healing, it suggests that understanding the role it plays in the blood of the skinks may have very direct benefits for us all. Exactly why these skinks are filled with this toxic substance and why it doesn’t kill them is something of a mystery. But new research published in Science Advances makes an important step towards answering these questions.